The Riedell name is synonymous with unmatched reliability, comfort, and fit. That’s the reason more and more rink managers rely on Riedell rental skates. Riedell skates are a profit building tool for rinks, providing durability and unparalleled longevity under the most rigorous conditions. From quad skates to hockey skates, Riedell provides you the finest stitched rental boot in the industry. 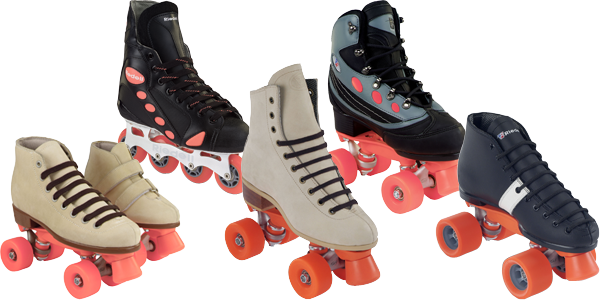 Riedell rental skate packages include PowerDyne plates, Radar (MDI) wheels and KwiK (chrome steel) speed bearings. Quality and construction made to withstand the test of time with skates designed for facilities wishing to provide the best, no matter what their budget. Riedell is the number one brand in rental skates. Rental packages pictured above (from left to right): 1900 Series, Inline Series, 7700 Series, Soft Series, and 124 Speed Series. Click below to download our rental brochure to learn more about our rental skates and how Riedell can improve your skating facility. For further assistance, please contact a sales representative at (800) 698-6893 or send an e-mail to margie@riedellskates.com.